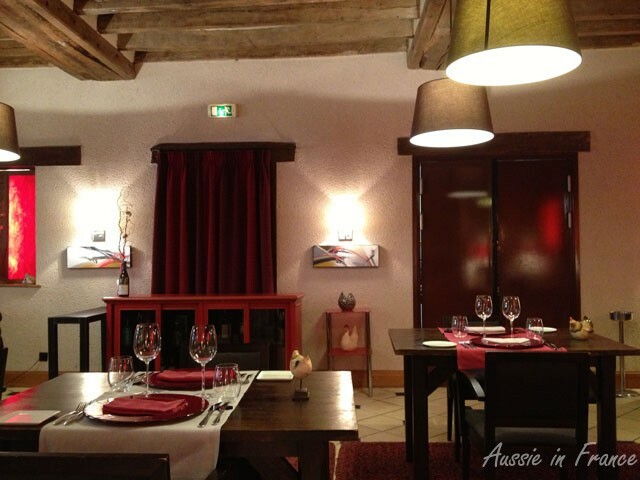 Last year Jean Michel and I also celebrated the anniversary of our meeting in the Loire and were very disappointed with the restaurant we chose. This year, we were much luckier. We arrived early too early for lunch at Montlivaut which is about 20 minutes from Blois in the direction of Saint Dyé sur Loire and on the way to Chambord so Jean Michel had the excellent idea of going a bit further on to Maslives where there is a shop that sells our favourite biscuits de Chambord. After stocking up, we went back to La Maison d’à côté (the house next door) in Montlivault and were the first patrons. Jean Michel made his usual joke about reserving the whole restaurant, I took a few photos and we sat down. We admired the resolutely modern decor with its beautiful wooden beams. 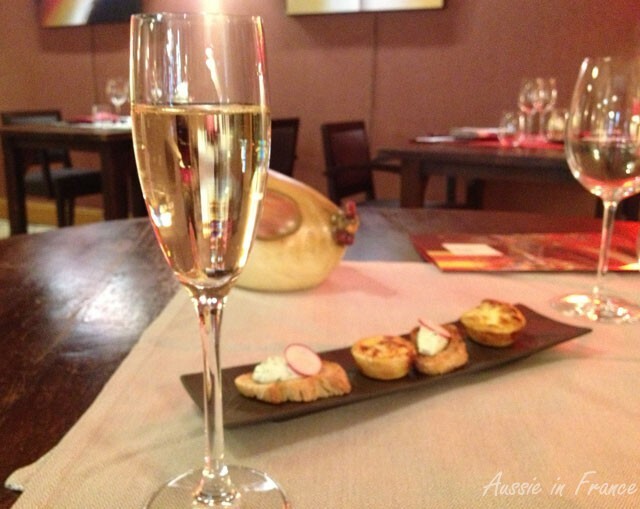 We started with champagne, forgetting we were in Touraine (we should have remembered to order vouvray), but it was excellent and accompanied by some delicious little nibbles so we had no regrets. There is a weekday midday menu at 19.50 (dish of the day and dessert) but we were celebrating after all so we chose a starter, main dish and dessert for 39 euro. We had a choice of three dishes each time. You can also have a starter + main or main + starter for 29 euro or an Expression Menu chosen by the chef for 50 euro (including cheese) or 65 euro (including a second starter). 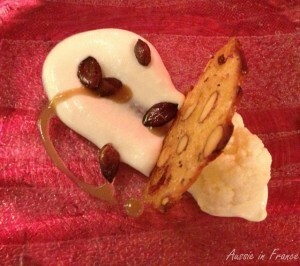 We were brought a patience on a cauliflower theme with an almond biscuit while waiting for our foie gras served with compote. I then had veal with “forgotten vegetables” while Jean Michel had pintade (guinea fowl) with potatoes. Both were delicious. I chose a glass of local cour cheverny while Jean Michel had a glass of burgundy. For dessert we had apple crumble and icecream and a lemon and almond dessert. Not very specific, I know, but unless I write them down (which I didn’t), I never remember the details. In any case, everything was delicious. The products were of excellent quality and very fresh. Madame Laurenty,the chef’s wife, told us that her husband buys from small producers all year round. We explained that as we are new to the area, we are still finding our way around. 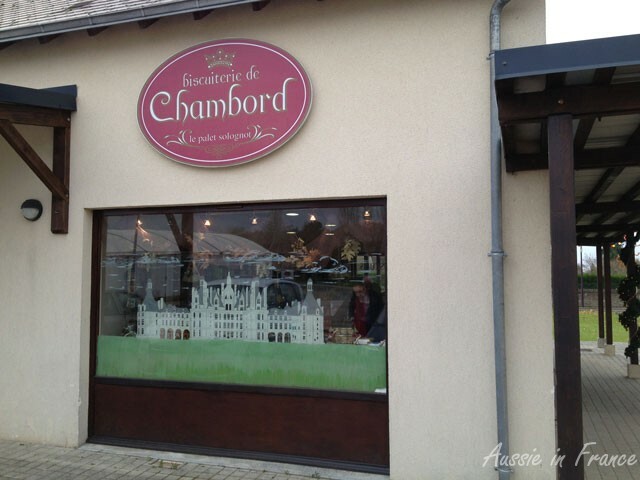 She recommended various markets, particularly Amboise on a Friday and the market at the Halles aux Grains in Blois on a Saturday and Montrichard. 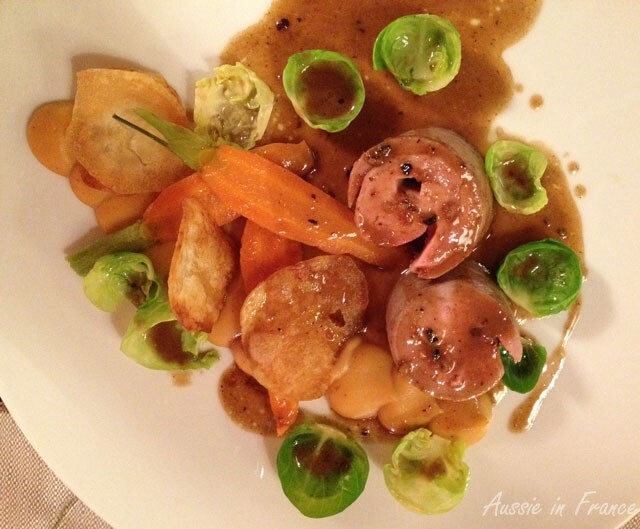 When we talked about our difficulty in finding fresh foie gras to make our foie gras for Christmas while we are in the Loire this year, she suggested we talk to the chef. 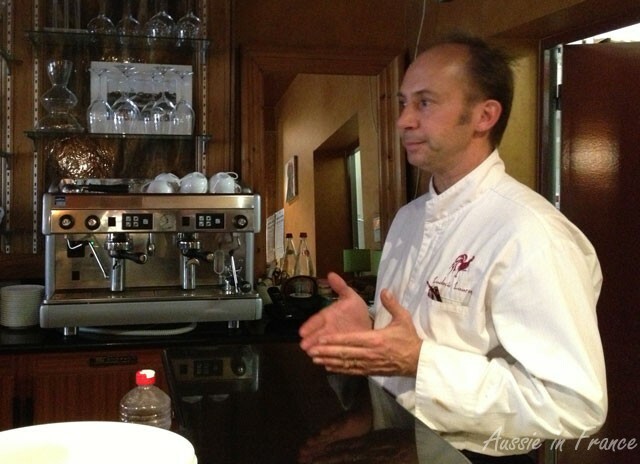 Ludovic Laurenty is passionate about his profession and generous in sharing his knowledge. He buys his foie gras from a producer in the south-west of France where they sing to the geese while they are force-feeding them so that they won’t be stressed. We are going back to Montlivault next Thursday because Monsieur Laurenty is expecting a delivery of fresh foie gras and has offered to provide us with one. This year we want to try the coarse salt method so I’m hoping the Mesturet Restaurant will share its recipe on FaceBook. I’ll keep you posted ! La Maison d’à côté, 25 route de Chambord, 41350 Montlivault. Tel 02 54 20 62 30. Closed Tuesday and Wednesday all year round. Open Friday evening, Saturday midday and evening and Sunday midday only from 17th November to 6th December. This entry was posted in Food, Loire Valley, Restaurants and tagged la maison d'à côté, Loire Valley restaurants, montlivault. Bookmark the permalink. 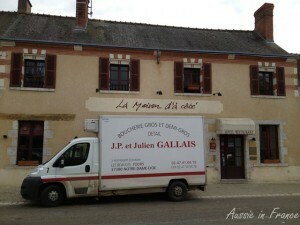 One of the fishmongers at Loches market can supply foie gras from a friend of his in season. I imagine if I asked Didier Marque, the owner/chef at La Gerbe d’Or he would get me one like M. Laurenty is doing for you too. Didier does classes in how to prepare them. 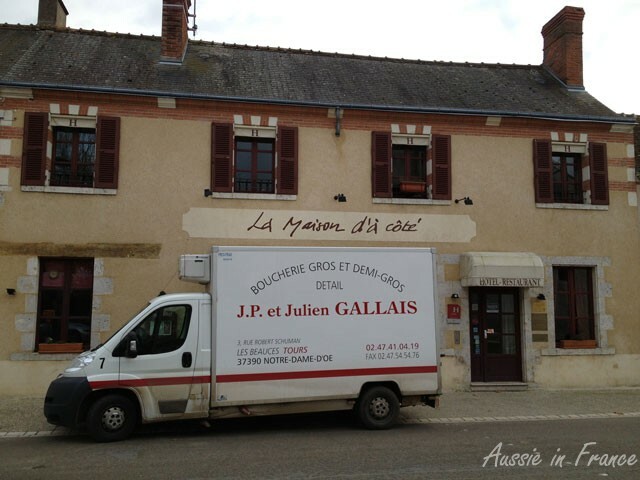 There is also a producer at la Celle Guenand (a couple of villages away from us). La Maison d’à côté sounds like a really nice experience, perfect for your anniversary. I like Montrichard market too. I haven’t been to the other two so can’t comment on them. M. Laurenty also gives classes. We were very lucky to have had a class (one is sufficient) in foie gras many years ago. It is surprisingly easy once you’ve seen it happen. M. Laurenty said prefers to buy from his supplier in the south-west. However, Mme Laurenty gave us a contact at Les Halles in Tours 02 47 80 04 71 which you might be interested in. 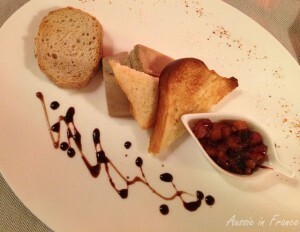 Getting good quality foie gras is extremely important. We bought some that came from Eastern Europe one year and were not happy with the result. I would ask Didier Marque if I were you (or try the one in Tours). Happy Anniversary! Sounds like a great meal and so very French! Thank you Andrea. It was really delicious! Happy Anniversary to you and J.M.!!! I admire that the meeting day is more significant for you,I feel the same and we celebrate too our Anniversary in November. Thank you Anna. 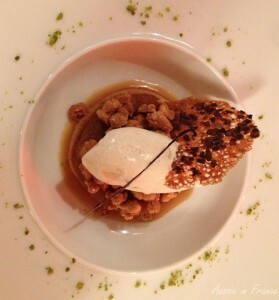 And, yes, you’ll have to try “foie gras” next time! 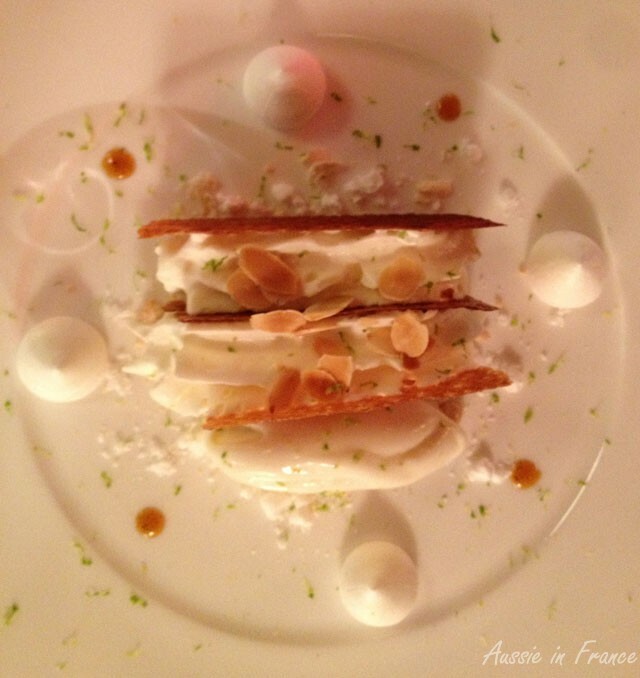 Have just found your blog site and must say that I am reading through with quite a bit of envy. Family, food, travel, romance – does it get any better. Will continue reading and enjoying your posts. Thank you Paula! I had a look at your blog and you seem to be pretty busy yourself. Shall feature it in my next Bloggers Round-Up if I may.